Sometimes it’s what is missing that’s more important than what’s present in a yacht. The noise of the engine, the shouts of the person next to you trying to speak over the din, the feeling that you need to grip something to feel secure. It’s only when all these things, often commonplace in a high-performance boat blasting along, are suddenly not there that you take notice. 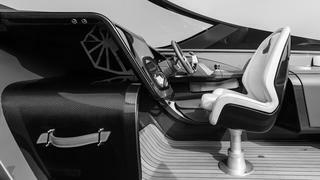 Such is the case on board the 11.1 metre Aston Martin AM37S from Quintessence Yachts. Speeding along the Monte Carlo coastline early in the morning, effortlessly cruising at 30 knots, the AM37S has a stillness unusual for a boat in her class. You can speak easily to someone on the other side of the cockpit without raising your voice, and the ride is smooth even when making a 360 degree turn and springing over our own wake. The AM37S climbs nicely on to the plane in a light chop and sits there as stable as anything. 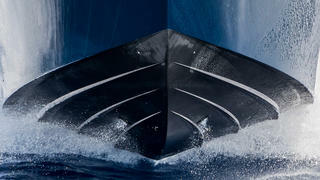 The trim tabs notch down slightly for added comfort, ensuring a totally dry ride as she accelerates to a 50 knot maximum speed. The founder of Quintessence Yachts is an Aston Martin owner who felt there wasn’t anything in the marine environment comparable with the feeling of being behind the wheel of his car. So the UK-based company was formed for the express purpose of bringing this project to life and approached Aston Martin with the idea. Within six months the two companies were working together and in two years the idea became a reality. 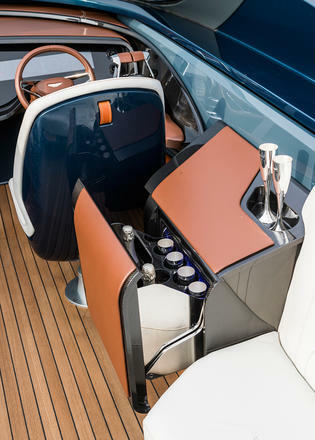 The entire boat is a blend of modern cleverness and old world craftsmanship, the high-tech epoxy composite and carbon fibre hull and carbon cockpit details blending with hand-stitched leather and teak decks. Aston Martin and Quintessence teamed up on the exterior. 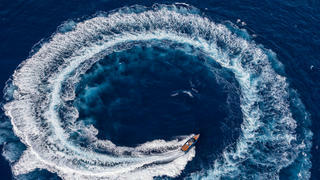 “Everything had to be checked from the nautical perspective, for what could be produced and what would be effective,” says Mariella Mengozzi, CEO of Quintessence Yachts. 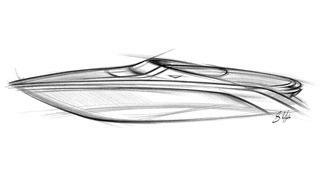 The biggest similarities between car and boat are the proportions, which Bassi notes are both inspired by Leonardo da Vinci’s Vitruvian Man. The result is sleek, elegant and curvy in all the right places. The helm really is reminiscent of sitting behind the wheel of an Aston Martin. The dash is pure artistry, the screen one continuous piece of glass framed by carbon fibre. The wheel and seats are automotive-inspired and completely custom, with the ergonomic design of the seats providing an unmatched level of comfort as a curve supports the lumbar spine. And just like a car, the seats adjust easily at the touch of a button. Owners can choose the colour scheme of their AM37 to match their car, with myriad paint and leather choices available, while the “Q programme” offers customisation options for someone who wants to specify further. 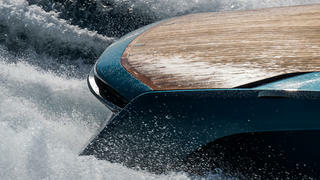 The first hull will be delivered in early 2017 to an owner based in Miami while the second hull is already underway. The pièce de résistance is the innovative sliding deck and swim platform. The entire cockpit can be closed off from the weather when not in use with a carbon panel, which slides completely out of the way upon boarding. The solid bimini is also secreted away under the engine hatch, which extends over the cockpit and can stay up even at full speed. Finally, a teak-covered swim platform appears on demand from the transom for easy boarding and water access. 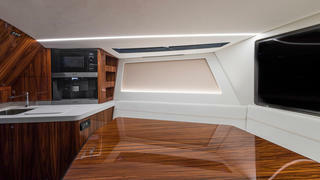 The interior affords just enough room to escape from the elements, with a sofa, galley with Miele appliances and head. A skylight in the deckhead brightens the space and strip lighting runs across the ceiling. Even the lighting design has been carefully considered, designed by Rogier van der Heide, whose previous work includes the Yas Marina hotel in Dubai and a number of large superyachts. But as with an Aston Martin car, it all comes back to the performance. 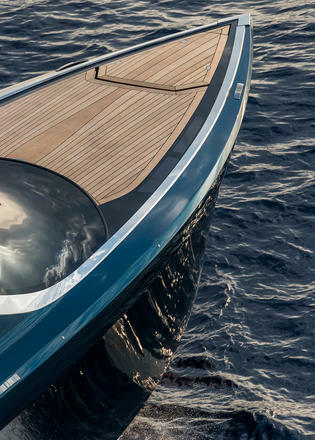 Naval architects Mulder Design created a deep-V, multi-stepped hull that gives a dry and comfortable ride. Engine options range from the standard 430hp engines to twin 520hp Mercurys, tested here in the “S” version, which take top speed to 50 knots and make the AM37S one of the world's fastest superyacht tenders. Twin 370hp diesels are also available. 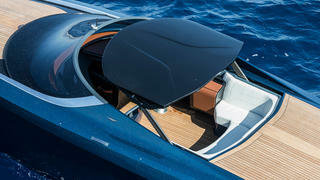 The AM37 is priced from £1.2 to £1.6 million, option dependent. 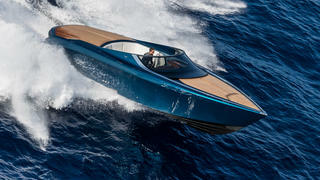 Though capable of reaching high speeds, the AM37 was never meant to be an extreme performance boat, but to offer the owner-operator ease of control so they could feel like they are in their Aston Martin, confidently handling turns, only out at sea.